Disclaimer: As many of these news are ancient, don't expect all links to still work. Dan Shane tells about his friendship with Don Rosa. Read it here. D.U.C.K.man -pages are showing the cover for "The Dream of a Lifetime" published in Norway this week. November 20, 2002: Re-negotiations, Disney comics returning to U.S. The world of Disney comics in going through a small upheaval. Italian Disney-creators are suing the Disney-Italy to get some basic rights to their own work. Don Rosa is re-negotiating his contract with Egmont for the same reasons. There will be no more stories from him until this is resolved. Best news is that Disney comics are doing a comeback in U.S. A company called Gemstone is about to start publishing Walt Disney's Comic and Stories and Uncle $crooge comics in April 2003. So Don might yet have a chance to read his own stories in english. You can check out the Finnish Rosa Calendar in Gallery. Here's my take on historical accuracy and other rambling about The Crocodile Collector. You may rate the story in Voting Booth. 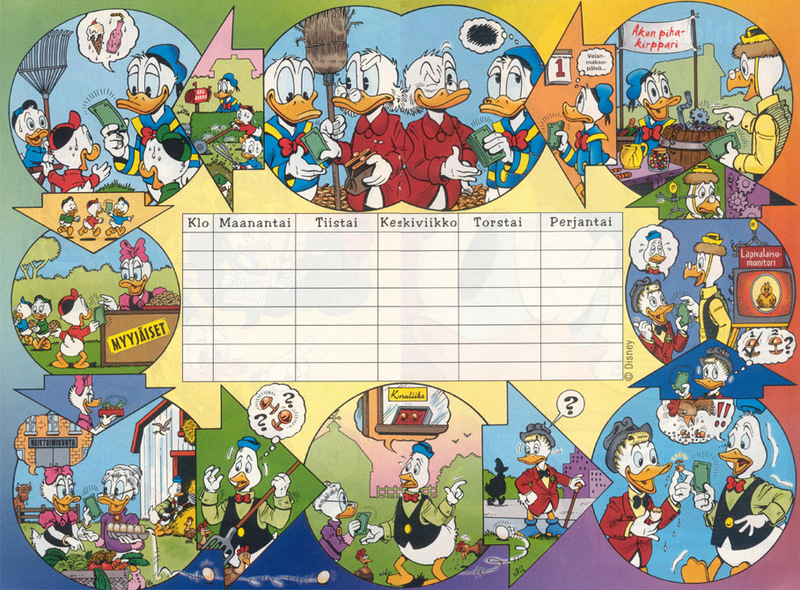 Go and see Duckmania's updated galleria of Onkel Dagobert-covers. Here´s the cover for The Sharpie of the Culebra Cut in Finnish Aku Ankka-magazine. 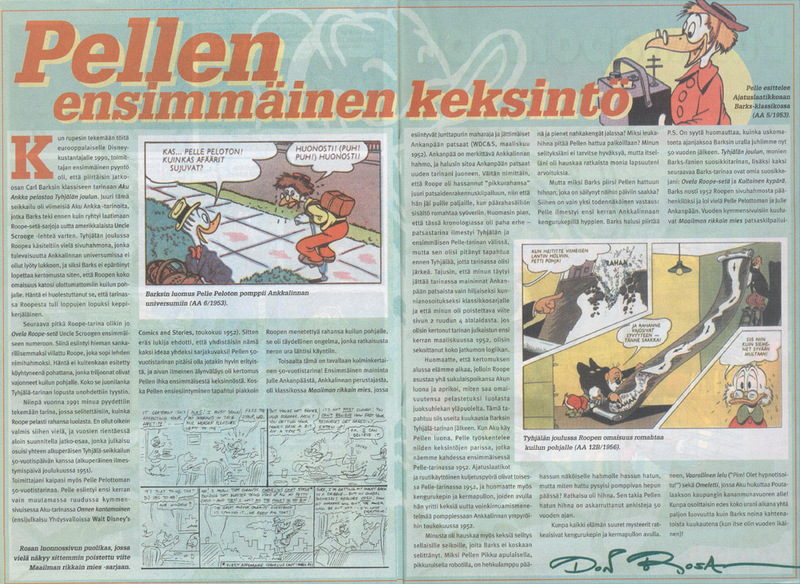 Don Rosa is really popular in Finland. Now there is a project for a printed fanzine in Finnish. It will be available in some bookstores. First issue will probably be out in early 2003. Miikka Mattheiszen is behind this project. 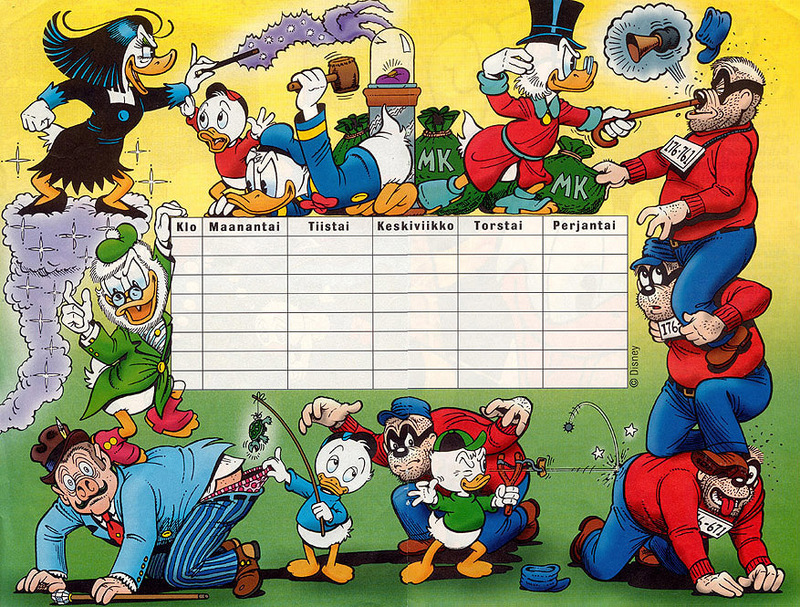 Just heard from the nice people of Aku Ankka (Finnish Donald Duck -weekly) that a new Don Rosa calendar for the year 2003 can soon be ordered through them (in the week 34). Also, the ''The Sharpie of the Culebra Cut'' will be published in Aku Ankka of the week 38-40. Same applies probably to other Scandinavian magazines. Welcome, friend. I'm Kai Saarto, the new webmaster. I'm 28y old historian and a big fan of Rosa and Barks. The old webmaster, Arttu, has decided to pursue new interests and the upkeep of these pages has fallen to me. Best of luck to him and thanks for the great job. Well, its good to be here, hope you enjoy your stay. Now is the English version's turn to have its birthday! To celebrate this a bit I've translated another forewords from the Quest for Kalevala -book: Treasure Under Glass. In the Articles and interviews -section there has already a while now been the translation of Cash Flow's forewords. But this doesn't mean I'd start translating them all. So here is the link for the forewords. The first part of Rosa's new story, Gyro's First Invention, was published in this week Aku Ankka, and the second part will of course come to next week's issue. Apart from the story the issue also had a cover and an article by Rosa. 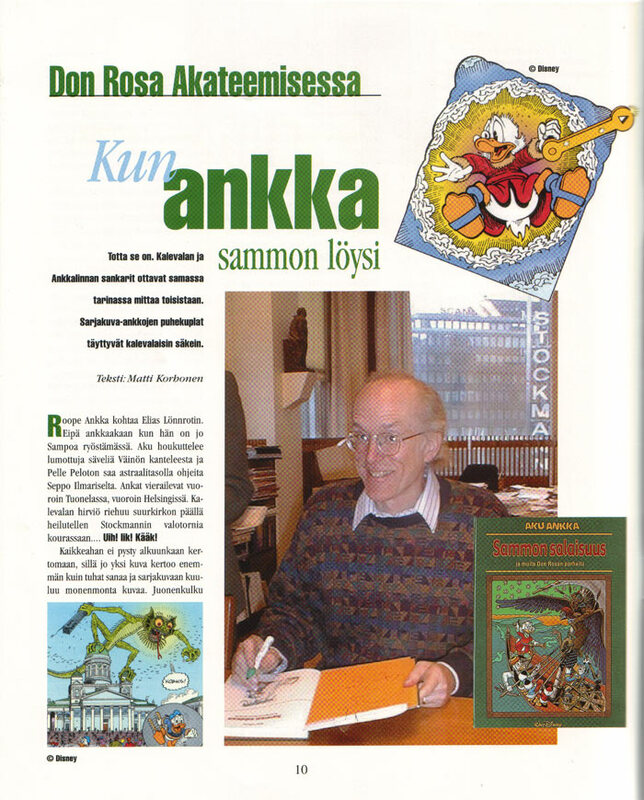 Don Rosa - Uusi Ankkamestari (the Finnish part of the site) has today its first birthday! In one year the site's mainpage has had 6509 visitors, the Finnish site 4234 and the English site (which is a bit over month younger) 3745 visitors. During one day the mainpage has about 40 visitors and a bit over thousand in a month. After the site moved to Perunamaa the number of visitors went immediately up. To celebrate the birthday I've made one new page: Thanks-page, where I've put the names of everyone who have helped me with the site. 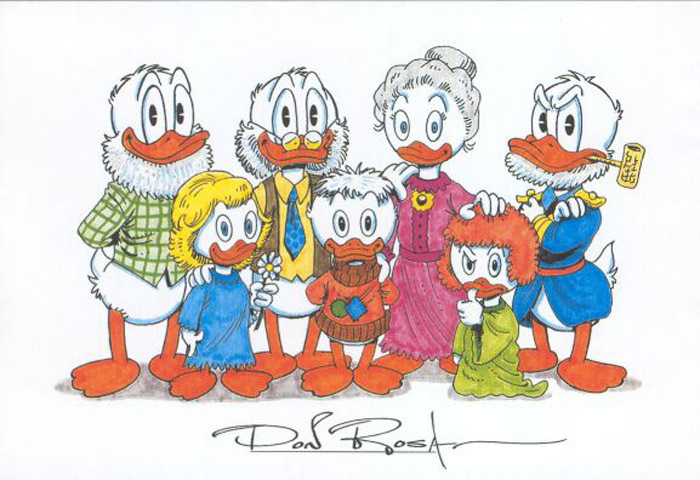 Hope I didn't forget anyone... And the Gallery has a new picture: Scrooge's Family Portrait, that apparently came to the orderers of the Finnish The Life and Times of Scrooge McDuck -book as a compensation for the book's delay. Thanks to Petri Kanninen for the scan. Don Rosa is the Guest of Honor at the Torino Comics -convetion. The fair will be up from April 25th to 28th in Italy. More information (in Italian) from http://www.torinocomics.com/. As in Scandinavia, in Finland, too, Forget it was published in this week's weekly, in Finland with the name Unohda koko juttu!. As always I've right away updated the necessary pages and scanned the cover Don draw to the story. The cover can be found from here, and of course from the Gallery. Unfortunately this time Aku Ankka didn't include Don's forewords to the story, but hopefully we'll still in the future have those, too. Articles and interviews -page (note the changed name) has now a new scanned article, Mevi 5/99's (Stockmann's staff magazine) article about the Quest for Kalevala -book and Rosa's visit in Finland. Also the magazine's cover has a Rosa-subject and it can be found from the Covers -page. Here are the direct links: article's pages 1 and 2 and the cover. Thanks to Kenneth Levanen, who scanned them. Advert: About this, too, you would've got a message to your e-mail, if you would've joined the Newsletter (or you did got if you have joined). Even in the Newsletter I sent to tell about these updates had info about new things that I didn't mention in the News, so those who haven't joined are missing them (heh, heh). Check out Newsletter here and stay updated! 7.2.2002 Site finally updated and moved! I've finally got finished updating and moving the site, that took way too long (surprising FTP-problems dealyed the move even more). So the new address is www.perunamaa.net/donrosa, but the old shortcut go.to/donrosa still works. You can also reach the site via Perunamaa's mainpage. Thanks to Antti Peltola, who told me about Perunamaa. The rest of the renewals are a bit smaller and you can find out them yourself. Of course I've also checked and updated every page. If something doesn't work etc, please let me know. Now, enjoy the site! The information on the site is a bit out-of-date because I've updated only the new upcoming pages. Sorry about that. So, I'm back from Lapland, and at home I had waiting for me a 68-page celebration issue of Aku Ankka. 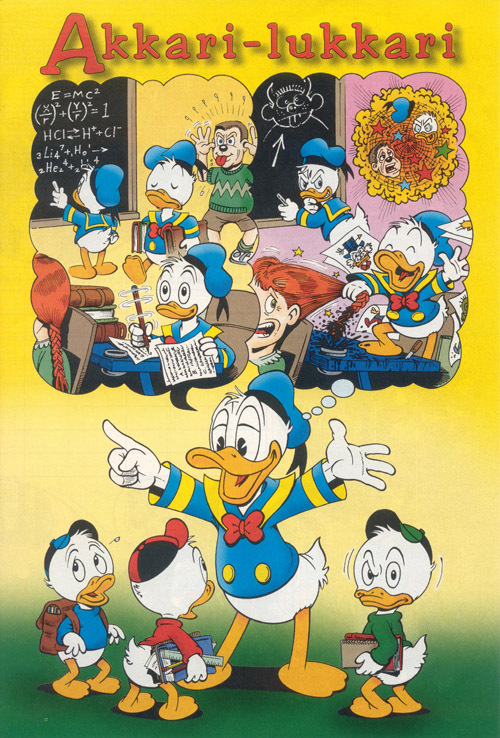 Among other great stories, it had Don Rosa's The Pied Piper of Duckburg. This was the first publication of that story in Finland. As I before mentioned, I'm moving the site to a new host, because I've spent all of the space given by Angelfire. Because of this I can't put the pictures of Aku Ankan Juhlakalenteri's October and November online. But I think I can get the site moved by the end of the year, although I'm not sure. So, Don's Finland's tuor is finally about to start tomorrow. I myself can't report about it any more, because I'm going for a week to Lapland on Saturday (what a bad luck that my trip is in the same week with Don's visit!). BTW, I just noticed that I hadn't remember to say, that there are originals of Quest for Kalevala shown in Cosmic Comic Cafessa on 19.11 - 3.12. Rosa is visiting in CCC on Monday 3.12. En på græskarlampen which is Fit to Be Pied (which is also in the new book) in Danish. the Danish version of The Crown of the Crusader Kings. Neither one isn't scanned by me. I won't put next month's or Novemeber's picture to the Aku Ankan Juhlakalenteri 2001. This because I've spent all of the 50 Mb's of web space that Angelfire gives and the picture doesn't have room enough anymore. Because of this, I'm already for a while being updating and renewing the site to move it to a bigger server. The work is almost finished now but it's still going to take a while, maybe even a quite long time. By the way, if someone knows a good server that gives unlimited web space I'd be very grateful for the info. 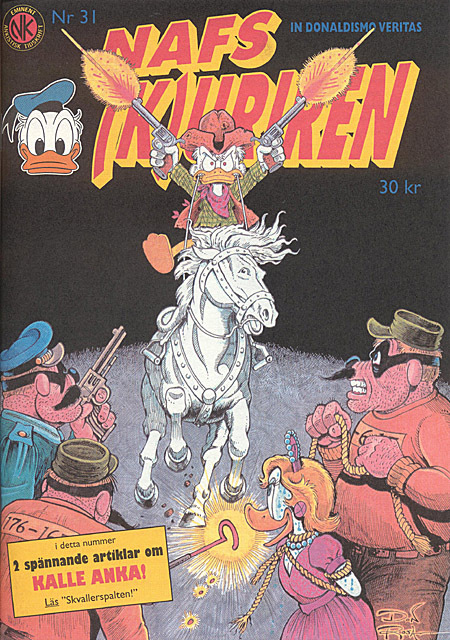 To another subject: As DUCKhunt in it's site announces the Don Rosa in Scandinavia -site maintainded by Sigvald Groesfjeld was lost during a server update. Because there weren't any backups of the site, it's now completely lost. So, if anyone has by any chance have saved the site to his harddisk, Sigvald would certainly be grateful if you'd let him know by e-mailing him to sigvald4@yahoo.no. This also affects to my site since especially the Stories -section has a lot of links to Sigvald's site. This being those links are now "dead". 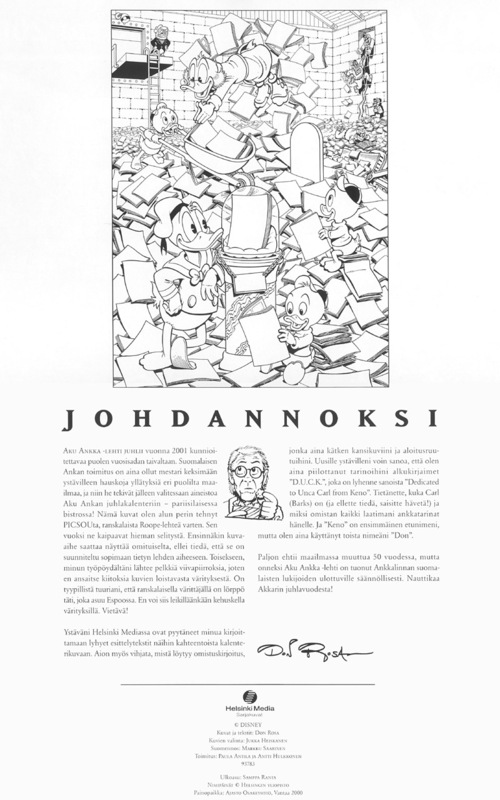 Helsinki Media has published a new book for the honor of Aku Ankka -comic book's 50th anniversary. As written above, the name of the book is Maailman hauskin kuvasarjalehti (The world's funniest comic book). In addition to articles there's also one comic story from each decade and there is also Don Rosa's An Eye for Detail. Also The Crown of the Crusader Kings -page has been updated. Among others I've added Links -subtitle and a picture of the book's cover! I'll add there new information whenever I get it. To make up that he couldn't go to the Book Fair in Sweden Don is going to Amadora International Comics Festival in Portugal, near Lisbon. As he told, this won't of course completely cover for the Swedish Fair, but it's the best he can do. Don is in Portugal on 26. - 29.10 and leaves on the 30th day. In the festival he is on the weekend or 26. - 28. and on Monday or the 29th day he's just is going to sightsee, since there are no flights to his home until the next day. The Festival starts on 19.10 and ends on 4.11. As you all already probably noticed there's also info about Rosa's new story given below, but, as it says, nothing is sure yet. I've added a new link to the Gallery's Stories -section: The Money Pit. The story is the American version and it replaces the French version of the Attaaaaaack! -story that used to be on that page. The link's page isn't done by me and isn't a part of this site. As you all probably already know, there was (and is) a big chaos in The States on Tuesday, 11.9. because of the destructive terrorist attack againt it. Our thoughts and prayers are with the thousands of innocent victims and their families and friends. Also because of this catastrophe and the disorder it caused to the air traffic, Don isn't going to, or maybe even couldn't, go to the Book Fair in Sweden this weekend. The page of the new Rosa-book has been updated and there is new info about the original drawings in the special edition. As I few days ago annouced, there will be a leatherbound, 100-volume edition of the new Rosa-book that will be published in the end of the year. Now I have some new information about it: The volumes 1-20 will include a color drawing by Don, and his autograph, the price of one volume is 1900 FIM (about 290 $). And volumes 21-100 contain a black and white drawing by Don, and his autograph, with the price of 1000 FIM (about 150 $). In a few days I will also make an own page to the book, which link can then be found from the frontpage. This, so that the infromation about it can be easily found even after the news about it go to the Archive. A new story has been added to the Gallery's stories -section, The Black Knight. As before, the story is in English, but this time also black and white. Apparently it's the editorial version of Donald Duck -comic book or something like that. You can find it here. Thanks for sending the scans to Jean-Luc Bovet. I've also updated the New stories by Don Rosa -section given below. Besides the story mentioned there he's also working on the illustration to the leatherbound 100-volume limited edition version of the upcoming Rosa -book (read the New Rosa-book -news) and a poster-version of the Money Bin blueprints that were originally drawn for The Beagle Boys vs. the Money Bin -story. The versio is being made so that Don would have other posters that just the Duck Family Tree to sing in book fairs and such. 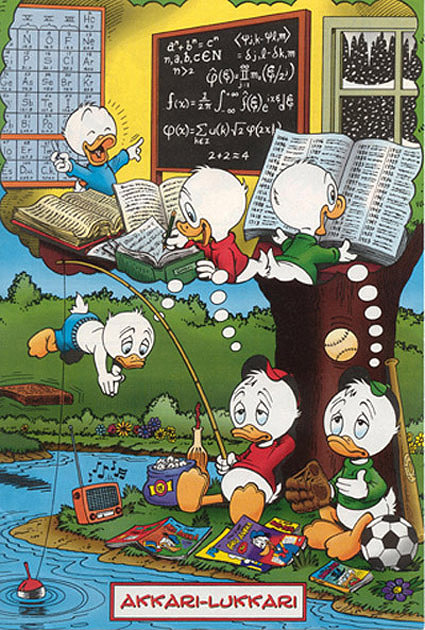 The newest Aku Ankka (33/01) has as an appendix a class schedule illustrated by Don Rosa, an Akkari-lukkari. The schedule itself is also a short story of a banknote's journey in Duckburg. The last time a class schedule drawn by Rosa was published in Aku Ankka was two years ago in number 33/99. Here are the links for the pictures: cover and schedule. And number 33/99: cover and schedule. From eight stories half of them haven't been published in Finland before this. As before, Don is also going to draw the cover and to write forewords to the stories. The book will be published in November and Don is touring in the bookstores of four different cities during the time between 29.11. and 5.12. He is also attenting in the 50th anniversary celebration of Aku Ankka 5.12. and has promised to wear tuxedo in the first time of his life! I have added two new American covers to the Gallery: Walt Disney's Comics & Stories 613 cover, that is also cover of The Incredible Shrinking Tightwad -story, which second part was published in that issue, and the cover of Walt Disney Giant 3: Donald, The Mighty Duck, which background panels are drawn by Carl Barks. I that same issue appeared both, Barks' Super Snooper and Rosa's Super Snooper Strikes Again. These, as all of my American Disney comic books, I've bought from Finnish collector Vesä Höijer (vhoijer@cc.jyu.fi). I have added a new link to the Links-section. 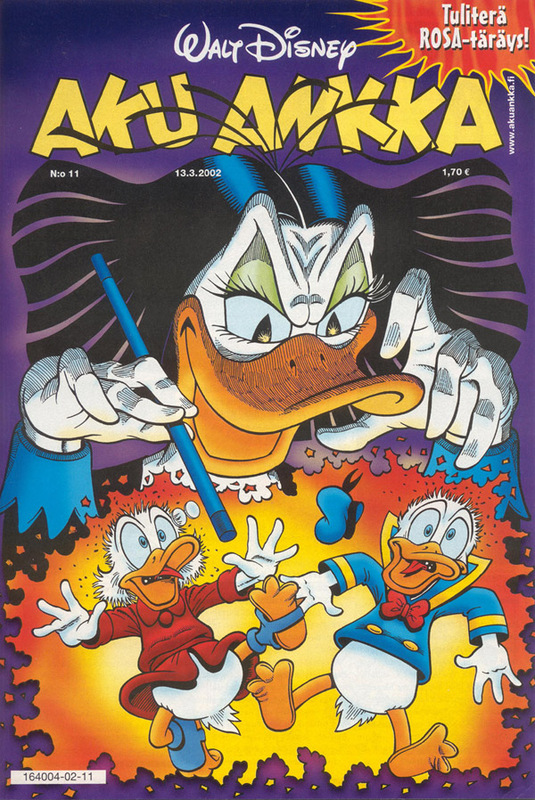 It's an Italian site about Donald's alter egosta, Papernik (Phantom Duck). The site's address is http://digilander.iol.it/Freckles/paperinik/paperinik.htm. The newest number of Ankkalinnan pamaus is an extra issue 1B/01, that will only ne sent to Ankists (Finnish Donaldists who are subscribers to AP). 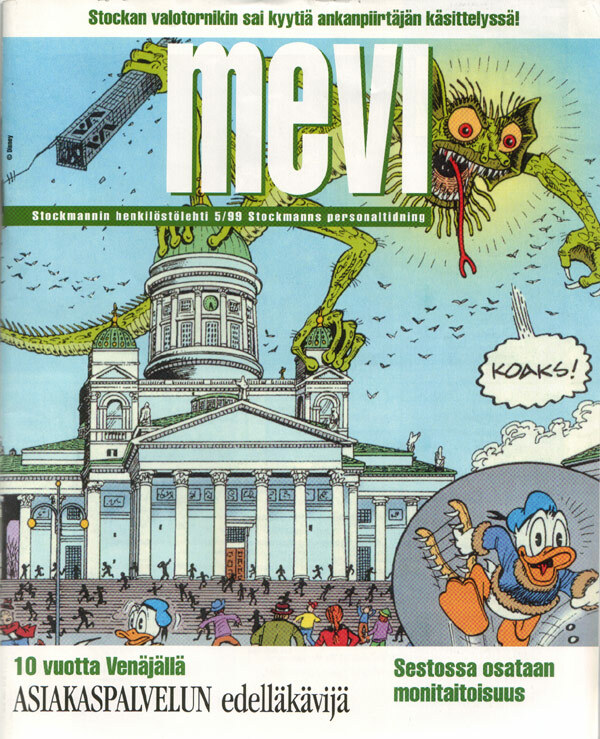 The issue contains greeting drawings by 11 Finnish comic artists to 50 years old Don Rosa. It includes for example a drawing by Kari Korhonen and a drawing by AP's editor Timo Ronkainen. The originals of the drawing were sent to Don on his birthday, but they were also made to this small extra issue. 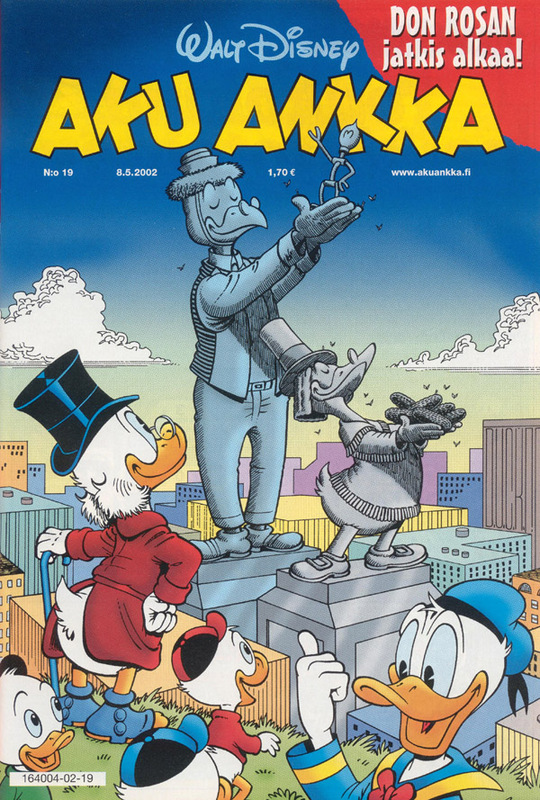 This week's Aku Ankka's cover is (althought with a different coloring) The Quest for Kalevala -cover, that Don originally draw for German Don Rosa -album series' issue 25 and on the other side of the cover is a Pin-Up that was first published in Picsou Magazine's number 344. The issue also inludes an article about where has The Quest for Kalevala been published so far. And all this is of course because the issue contains The Quest for Kalevala -story's part II/III. In the honor of that I have now added to my site that Articles-section I told about while ago. Next week's Aku Ankka will publish the last part of the story, but I'm not going to tell about it here unless it also includes something extra. 29.6.2001 Don Rosa 50 years! Today is Don Rosa's 50th birthday! Congratulations to Don! In the honour of the anniversary I have four new thing in my site. The first one is of course "countdown's" last story The Treasure of the Ten Avatars. By the way, I'll take that section away next Friday, but you can still read the stories from Gallery's stories-section. A whole new section is Don Rosa's Disney-stories, which is a index of all of Rosa's Disney-stories. I addition there is a guestbook, which you can find from Feedback-section or, at least for now, from the frontpage. 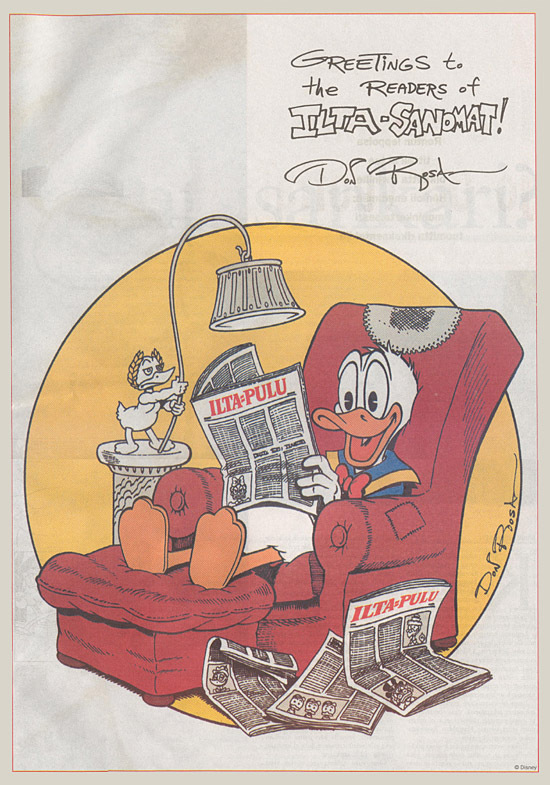 The last new thing is a picture that Don draw for Ilta-Sanomat (Finnish newspaper) and which was published in Ilta-Sanomat's weekly appendix 10.2.2001 in the honour that Donald Duck had been published in IS for 60 years. This is where the new stuffs end, I hope you enjoy them. 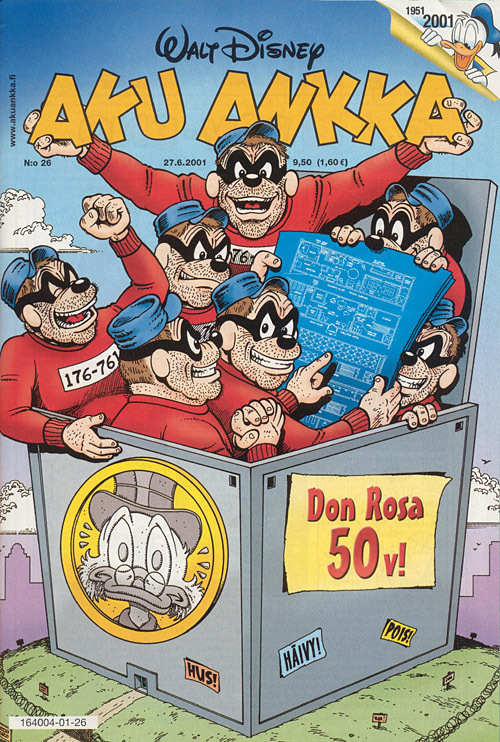 In Aku Ankka's number 26/01 was published, as I two news ago annouced, Don's news Beagle Boys-story and his 50th anniversary interview (that will later appear, like all the other articles and interviews about Don Rosa that have been published in Aku Ankka, in my site's upcoming Articles-section), but also a cover drawn by Don, Jukka Tilsa's (Finnish comic artist) greetings comic and The Quest for Kalevala-story's part I/III. My site (and I myself) is now officially a member of DUCKhunt. In result to this the non-Disney comics -section's pages are now also a part of DUCKhunt and to mark that I have put to the bottom of them a DUCKhunt logo. So now you can access my site also from DUCKhunt. Other than that nothing changes in my site. Helsinki Media published a new comic album called Ankan siivellä (256 p.), that contains the best stories from Aku Ankka's 50-years journey. It includes Don Rosa's The Richest Duck in the World. Starting from this day I will put every Friday untill Don Rosa's birthday (29.6) the scans of one Don Rosa-story to my site. None of the stories have been published in Finland. So, there will be four stories in all. The first story is Fit to Be Pied and you can find it, and later the other stories, too, from here. I've finally finished the English translation. Now the site has a new mainpage where you can choose which language you want. The English part can also be entered by adding english.html to the end of the address and the Finnish by adding suomi.html. I apology for all the errors there might be in the English version. I would like to give my thanks to the following people for helping me with this site: Mikko Kiviharju, Simon René Magnussen, Anders Christian Sivebaek and Thomas Lauritsen. I have both, added June's and introduction's pictures to Aku Ankan Juhlakalenteri 2001 -section and scanned all the present pictures again in bigger size. By time I'm going to updates other slightly failed pictures, too. As you can see I have also reorganized this page a little bit, so, that one month's news are shown at a time and the others, old ones, can be found from Archive (look down). Later, when there's more new stories, I'll do the same with them. Today I put the cover of the Swedish fanzine NAFS(k)uriren's issue 31 to Gallery's covers-section. The cover's model was western comic book Tim Holt's number 17. 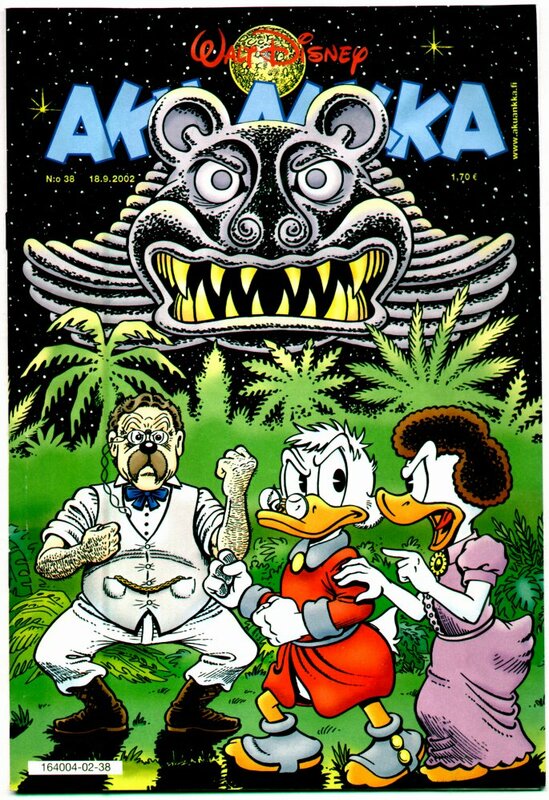 The original, Frank Fazetta's cover interested Don Rosa from a little boy and finally he draw a Disney-version of it, which was originally intented to be a birthday present for Pekka Tuliara, who is Roope-setä comic book's editor. But Don liked his drawing so much that he suggested NAFS(k)uriren to use it and so, the fanzine made it cover for it's issue 31 and even as a color print. Here you can find the cover. Thanks to Mikko Kiviharju for translating an article from the fanzine. In the resently published number of Ankkalinnan pamaus-fanzine, 4/00, there begins an an interview series of Don Rosa, for the honour of his 50th birthday. It's made by F.A. Elliot and translated to Finnish by Timo Ronkainen. You can find information how to order the fanzine from it's homepage (Finnish). I apology the possible troubles that this problem may have caused. I have already now began making an English version of the site, because I've been asked to do so, so it can co-operate with D.U.C.K.hunt. But it's still going to take a while before the translation is ready. Now I've also annouced to Disney-mailing lists and search engines about the site! I'ts open to everyone now! My site (the Finnish one) is finally ready after four months of hard work! I just annouced about it to Don Rosa and after a week I'll tell to the outside world, too! Aku Ankka announced in it's this week's number (17/01) about the ten part series made to celebrate Carl Barks' 100th birthday by the Egmont-company's comic authors. In it Egmont's best drawers and writers have choosed a character which Barks has invented and made a story about it, where she/he interprets the character with her/his own style. The series will be published during the year and in Aku Akka the first story is Ferioli's Gladstone Gander -story which will be published in the same number. If the list by Aku Ankka is correct, the next story should be Don's. 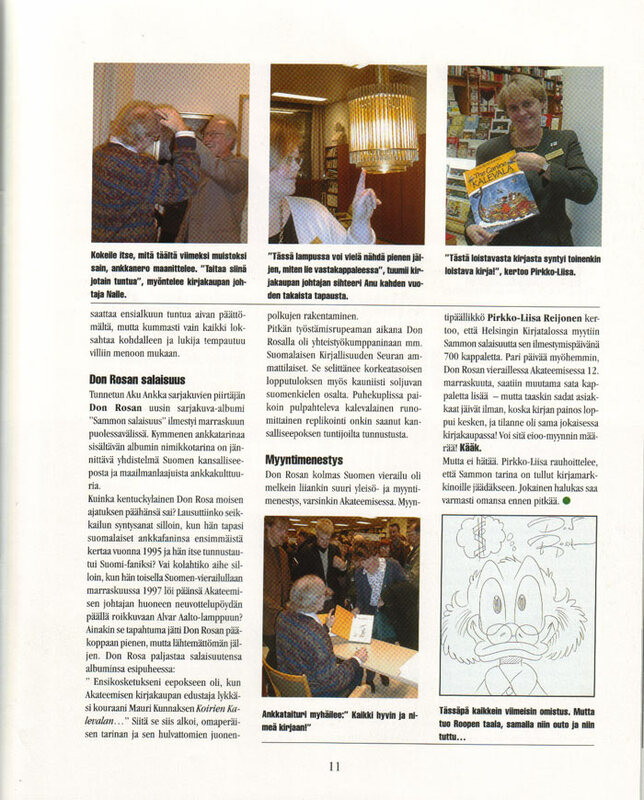 In the city of Helsinki's artmuseum, Tennnispalatsi, there is from 04/12/2001 to 07/15/2001 an Carl Barks-exhibition. On display is samples of the Carl Barks-collector Marko Leppänen's private collection. There is also a discussion occasion about Barks on 16th of May at 7 pm. I did now get the scanner as a christmas present! Now I can really start doing the pages! Today I started making the pages even though I didn't get a scanner as a christmas present.